If the timing were not wrong, I would be certain that this hotel was created when the owner told his design team to build something that looks like a lair for Dr. Evil. As it turns out, the first Austin Powers movie post-dates the building of this hotel. But come on, it even has a frickin’ laser beam coming out of the pyramid, although it would be even more fun and garish if it came out of the Sphinx head. I discovered it is hard to take a good photograph of the Luxor Pyramid and Sphinx from the strip, because there is an overwhelming amount of unwanted light coming either from street lights or parking lot lamps. This is an unusual part of the strip, near its far southern end, where there is a lot less going on. 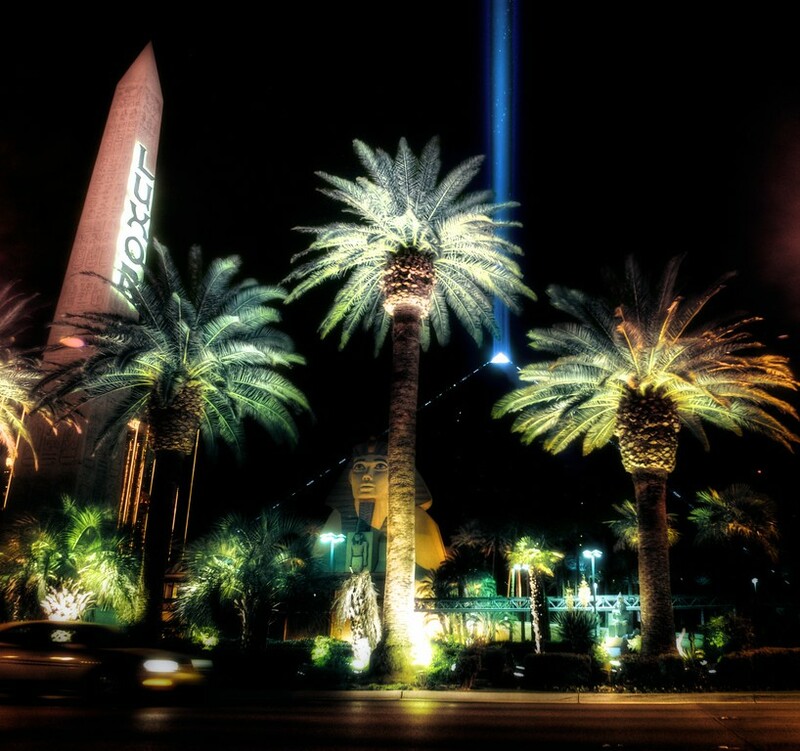 There is basically nothing across the street from the Luxor (ie directly behind the POV of this image), and the hotels here, while fitting in with the over the top architecture of the rest of the strip, are further apart, set back, and less brightly lit. So when you try to get a nice image of the dark pyramid with its sort of understated light system, all those parking lot lights muck things up. The effect is even worse when shooting from across the strip directly in front of the hotel. I dealt with it with a little post-processing fixes and some cropping. Had I more time in the city I would have explored better view points. Apparently you can get some great shots from a distance, including from the airport, and a long lens. I see what you mean here Mark, but you still rocked this shot. Love the light beam from the top of the pyramid! Nice composition and processing Mark. Also dig the the reference to Austin Powers and Frickin Laser! Nice work getting the laser with all of the light on the strip Mark. These is really awesome! I like traveling but I never been in that place yet, Next on the spot. I’m coming! Very attractive.